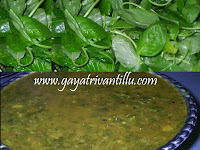 Select big carom leaves for this recipe. While plucking the leaves retain a portion of the stem along with the leaf. When the bajjis are fried along with the stem they appear good. If you observe, the leaves will look thicker and smell great. Wash the leaves and pat dry them. Heat a pan and add oil for frying the bajjis. While the oil is getting heated up, prepare the batter. Sift the gram flour through a fine sieve. To the sifted gram flour add baking soda, red chili powder and salt. Mix well and add a teaspoon of hot oil to the gram flour mixture. Mix well by rubbing with fingers so that the oil is evenly coated to the gram flour. Add water little by little and make a smooth batter without any lumps. The consistency should be thick then the batter will coat the leaves when dipped. Spread a paper napkin on a plate. After frying, if we place the bajjis on the paper napkin, it will soak the excess oil. When oil is sufficiently hot, start frying the bajjis. 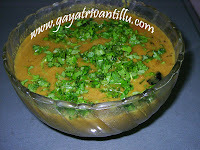 Take a carom leaf and dip it in the batter. Ensure that batter is coated all over the leaf. Then remove excess batter that is dripping. Add this batter coated carom leaf to hot oil and fry. Similarly add few more leaves and fry on medium heat turning the sides with a ladle. When the bajjis are golden brown in color drain them from oil and place them on the paper napkin to soak excess oil. Fry the remaining leaves after dipping them in batter. Fry on medium heat only. When all the bajjis are fried, serve them hot with a sauce or chutney of your choice. Use carom leaves which are bigger in size. Use fresh leaves so that they are firm—not wilted. For fluffier bajjis, use baking soda as per the measurements given. One may even reduce the quantity of baking soda as per choice. Pluck the carom leaves along with some portion of the stem. It will be easier to dip the carom leaf in batter by holding the stem. After the bajjis are fried they give a nice shape when fried along with the stem. While making the batter, take care to add water slowly to get the right consistency. Mix the batter well avoiding lumps. While dropping the batter coated carom leaf in oil—take care—oil will be too hot—if the oil spills on the skin there will be burns. Carom leaves have a distinct smell and gives relief by smelling a leaf when suffering from stomach disorders. Serve hot with any sauce or chutney. 60 Recipes you may also like to watch.